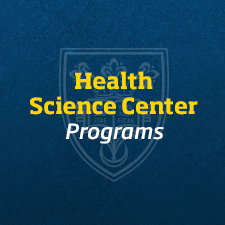 Health Science Center | Graduate Health Science Programs | St. Scholastica | Duluth, Minn.
Our Health Science Center is home to our newly expanded Occupational Therapy, Physical Therapy and Physician Assistant Studies programs. Conveniently located at 940 Woodland Ave., about a mile from the main Duluth campus, the Health Science Center houses classrooms, laboratories, and maurices Community Clinic, where students serve patients who have little or no insurance. The three-story, 45,000 sq. ft. building is in the vibrant BlueStone development area. Students can take advantage of on-site housing at BlueStone Lofts or BlueStone Flats, and enjoy the nearby shops and restaurants. Whether looking for a quiet study space or areas for group work and socializing, the Health Science Center offers students plenty of choices with spectacular views of Lake Superior. The building includes four lecture spaces and three labs where students learn from faculty who are experienced practitioners and leaders in their fields. These spaces are specifically designed to integrate classroom teaching and experiential learning. 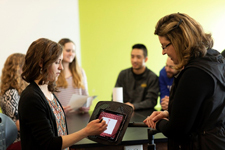 In the Assistive Technology Lab, students develop skills in designing and using assistive technologies aimed at improving a client’s independence in daily tasks at work, school, or play. Students also practice specialized skills like splinting and casting. In the Mat Lab, students learn hands-on skills required to evaluate and treat patients. Curriculum is typically focused on musculoskeletal skills, physical agents and therapeutic exercise. 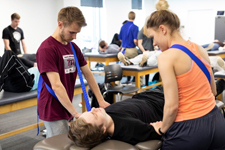 The Plinth Lab offers space where students can learn hands-on skills involving large-motor skills related to evaluation and treatment of adults with acquired or degenerative diseases and/or pediatric clients. Thanks to generous support from maurices, a retail clothing chain based in Duluth, MN, the student-run educational clinic offers physical and occupational therapy services to people with little to no insurance, and to the St. Scholastica community. Care is supervised by program faculty. 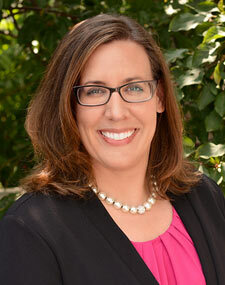 The clinic offers invaluable interprofessional educational experiences. 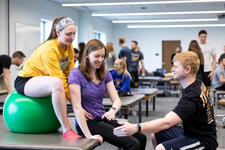 Students from St. Scholastica's Occupational Therapy and Physical Therapy programs, UMD’s Pharmacy program and the Lake Superior College Physical Therapy Assistant program collaborate to provide a variety of services to patients. The clinic includes an Adult Gym, a Pediatric Gym, and an Activities for Daily Living (ADL) Suite where students learn assessment and intervention techniques for patients who require training, adaptive equipment, or assistive technology to promote independence in daily living skills, such as cooking, cleaning, dressing and hygiene. 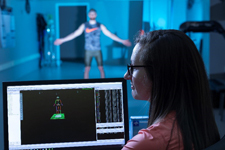 The Sensorimotor Behavior Laboratory is a combined research and academic space​ used for human movement data capture and analysis using several types of instrumentation and computing methods. St. Scholastica is committed to ensuring its campuses are accessible for all students. Please reference the Center for Equal Access for assistance and more information.